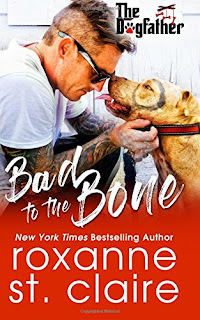 I’ve been reading Roxanne St. Claire’s books for several years and, in that time, many of her titles have made their way to my keeper shelves but none have touched me as deeply as her newest release, Bad to the Bone. We’ve come to know veterinarian and single mom, Molly Kilcannon and her daughter, Pru over the course of the first four stories in St. Claire’s The Dogfather series. Like Pru, I’ve become increasingly curious about the identity of her father with each book but never in a million years would I have guessed that Pru’s father – and Molly’s hero – would be a man who has spent the past 14 years in prison for murder. I didn’t know what to expect of Trace – 14 years in prison had to have taken a toll on him, both physically and emotionally - but all it took was the opening scenes between Trace and his critically ill dog, Meatball, and his subsequent interactions with Pru and Molly, for me to know this was a man with depth, layers, vulnerability, and a good heart. I was firmly in his corner and I knew there had to be more to his story than would first appear. What did you think of our hero, Janga? Janga: I thought he was wonderful, PJ. It has been a long time since I encountered a contemporary hero who captured my sympathy, affection, and interest so quickly and completely. Like you, I have wondered about Pru's father as I read each book in this series, but Trace was much better than I could have imagined. I was also impressed with the way St. Claire handled Molly's reaction to Trace's reappearance in her life. With an ex-con hero, she could so easily have drifted into the melodramatic, but she keeps Molly's fears believable and allows that instinctual connection between the hero and heroine to evolve as they spend time together. I like my romance with lots of context, and I loved that Molly was such a relationship-rich character. St. Claire shows us how her ties with her mother, her father, and her siblings as well as her history with Trace and her role as Pru's mother have shaped her into the strong, vulnerable woman she has become. Trace and Molly are very different, but they are both fully dimensional characters. And Pru - what a great kid she is! What did you think of her, PJ? PJ: Oh, I loved her! For 13 years, she and her mom have been a unit and the appearance of the father she's never known - or known about - turns her world upside down as much as it does Molly's. And, for that matter, Trace's. I really appreciate that St. Claire made this book as much about Pru's journey as Molly and Trace's. I've known a few kids like Pru, with vibrant personalities and a strongly formed sense of right and wrong. When you view the world in black and white, being suddenly presented with an ex-con father can't be easy, especially at that middle school age when so many other things are changing. Pru's individual journey as well as the evolution of her relationships with both of her parents was at various times awkward, humorous, heartbreaking, and poignant but, above all, realistic. I doubt I'm the only reader who hopes for a grown-up story for her a few years down the road. That girl is going to be one fierce woman. Another facet of Pru that I really enjoyed is her close bond with her feisty great-grandmother, Gramma Finnie, and her grandfather, Daniel a/k/a The Dogfather, two characters who really are the heart of this family. Do you agree? Janga: I do indeed. I adore Gramma Finnie. I think St. Claire was brilliant to make her a combination of the traditional grandmother figure with her fierce love of family, her fund of stories, and her hard-earned wisdom, which she is not reluctant to share, and twenty-first-century, tech-savvy golden-ager. I want to read her blogs! And I confess to falling a little more in love with Daniel with each book. I want to see him happy again, but it is going to take someone very special to deserve him and to understand the place his beloved Annie will always have in his heart. PJ: I feel the same, Janga. I'm eagerly anticipating Daniel's book and I fully expect it to be an emotional journey. Time to buy more tissues! I think St. Claire was smart to not only make The Dogfather series family-centric but to also center the stories around a dog rescue and training facility. The unconditional love offered by these dogs, as well as their bond with their humans and their ability to soothe, encourage, protect, and unite has been intrinsic to these stories. Quite a tall order but each of the dogs featured has been up to the task and has added an extra dimension to the story that I have thoroughly enjoyed. Janga: The canine characters are certainly an integral part of the stories and of my delight in them. I also love that the cover dogs are real rescues who have found their forever homes. I know that we both have had the experience of a rescue claiming a chunk of our hearts and feel strongly about the mission of shelters such as the one these books support. So--we still have Aidan's story, Darcy's story, and Daniel's story to look forward to? When it comes to this series, I'm a greedy reader. I hope at some point St. Claire will write stories for the five Mahoneys too. Do you have any scoops on the future of the series, PJ? PJ: Why yes, I do! I reached out to the author and...there will definitely be a lot more Dogfather books in the foreseeable future! She says that the next book, Ruff Around the Edges, will be out in April, and it's a love story for Aidan Kilcannon, who has come home from Afghanistan where he's been flying helicopters as a Night Stalker in the Army. Once again, the Dogfather is nudging Aidan toward love, and, of course, there's an unforgettable pupper named Ruff right in the middle of it all. After that, Darcy will be the object of her father's matchmaking in a July release called Double Dog Dare. St. Claire has promised that Daniel's highly anticipated story, Old Dog New Tricks, will also be released this year and has hinted there could be another Christmas novella, too. That's three (possibly four) new Dogfather books this year. I'm sure I'm not the only one happy dancing at that news! She's promised that 2019 will be the year for the Mahoney cousins, Declan, Connor, Braden, and Ella, and leaves us with this teaser: "Who knows? Maybe the Dogfather will work his magic on Aunt Colleen or readers might get a flashback romance to find out just how Gramma Finnie fell in love with her beloved Seamus back in Ireland." I'm not ashamed to say I'm quivering with excitement, just like the adorable pups at Waterford Farm! One more thing. Did you know that St. Claire donates a portion of the first month's sales from each Dogfather book to a no-kill shelter in her home state of Florida? Or that in addition to rescue dogs, the covers of the Dogfather books also feature local heroes, not models? St. Claire is headed to Alaqua Animal Refuge soon to shoot the next four or five covers for the series. And, with the help of readers who have purchased the Dogfather books, she's been able to send close to $5,000 to Alaqua. It's a win for everyone! One thing is for sure, this series has captured the hearts of readers around the world. I'm sure all Dogfather fans are as happy as we are at the news that Roxanne St. Claire plans to keep the romance and rescues coming. Have you read any of The Dogfather books yet? Do you have a favorite book/couple/character/dog from the series? Tell me about the animals who hold your heart. I'm giving away a Kindle copy of Bad to the Bone to two randomly chosen people who post a comment before 11:00 PM, Sunday, February 4. In addition to that, Roxanne St. Claire has generously offered a signed, print copy of one of The Dogfather books (winner's choice) to two randomly chosen people who post a comment before 11:00 PM, Sunday, February 4. I haven't read any of this series yet but I am definitely going to look for them. This story looks wonderful and unique. I live with my two cats and my daughter's two dogs so there is always a furry friend or four around for you to pet. I hope you enjoy them as much as I have, Maureen. Each book in the series stands on its own but I do think reading them in order will give you a deeper understanding of and appreciation for this special family. I have them on my TBR but haven't had a chance to read them yet because of deadlines. And I have two cat companions at the moment. I have a delightful and loving dog, from Lap Dog Rescue who is the best companion and is sweet, understanding and sensitive. The books sound captivating. I would love to win a print copy of one the Dogfather books. I am really interested in this series. Have been hearing great things about this book and this series. I LOVE dogs and it was the photo of the dog on the cover that lead me here. He looks like the same breed that my pup is. I adore the idea of a series taking place around a rescue. The fact that the dogs on the covers are real rescues brought tears to my eyes since all canine companions have been rescues. I will most definitely be picking up all the books in this series ASAP. This sounds like a great series. I have not read them but had read some of this author's Bullet Catchers series years ago. During my high school years, my mom finally caved and allowed us to have a cat. Prior to that we had some very lively hamsters. But Reba, our feline friend, was absolutely special. She was wonderfully gentle with people but was absolutely fearless regarding the dogs in the neighborhood. I still miss her. I have not read any Dogfather books yet. Have book 1 & 2 in TBR. I know I've read the first book in the series. I love that she started this series to aid in dog rescue and training facilities. I love this series. I have read all of them so far and am currently about 3/4 through "Bad To The Bone". I think its my favorite so far. I am so happy there will be more in the series. The more the better!! I have a goofy Beagle/Pit mix, Taffygirl! She is a rescue from our local Humane Society. I don't what I would do without her. Have not read any of this series, but anyone who is helping dog rescues must be a wonderful person. I will need to look into this series. I have lived with rescued dogs for quite sometime, so I must support Ms StClaire. After years of having herding dogs like collies, I now have a cairn terrier who is very smart, funny and above all else extremely loyal. He's with me wherever I go, celebrating when I'm happy and trying to cheer me up when I'm not. His understanding of vocabulary is just astonishing. Can you tell I love him? Great discussion and review, ladies. I read the first in the series but the rest got lost in the shuffle I guess. Time to catch up! I love that Roxanne is donating part of the proceeds to a shelter. I'm a big believer in the power of a furry companion. I love when authors work them into their books and give them their own personality. We are definitely dog people and proud owners of 2 - a Sheepdog (we bought) and a Terrier (we rescued). I have read and loved all of them!! Like you PJ, Bad to the Bone tugged at my heart and I went through a number of tissues reading it. Roxanne St. Claire has become one of my favorite authors with me anxiously waiting for her next book. I do hope you shared this post with her as I'm sure she would enjoy it. Thanks you so much for your discussion about this wonderful book. I haven't read the Dogfather books, just the Barefoot books. This series is new to me, but I am excited to find and read the books. I have no pets, but I do pet-sit for friends because I love animals. I haven't read this series yet, but I do like animals in books. Missed the deadline. Too bad. I enjoy her books. She does a wonderful job of character development and weaves great stories around them. Animals, especially dogs, add a lot to any story and relationship.